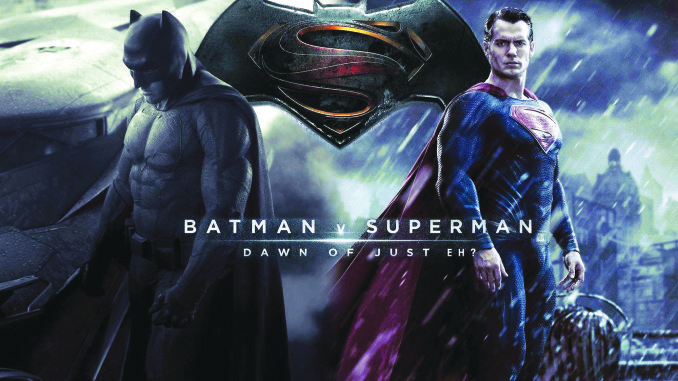 Batman V Superman: Dawn of Just Eh? The last time Batman and Superman, unarguably the two most well-known superheroes in the canon, faced each other on the big screen was, well . . . never. Ever since the announcement at Comic Con in 2013, fans have been looking forward to the day when these two juggernauts would face each other in an epic battle that would go down in popular culture history. It was essential for director Zack Snyder and his crew to get it right. According to the majority of the population, they didn’t. To narrow down the film’s plot would be difficult, considering it moves chaotically in various directions. The film starts logically, introducing the new Bruce Wayne/Batman (Ben Affleck). We see Snyder’s retelling of the death of the Wayne’s parents, and then we learn what exactly Wayne was up to when Superman (Henry Cavill) fought General Zod (Michael Shannon) at the end of “Man of Steel.” Tracking with me? The plot then fast forwards 18 months, and we start to see how the world has changed with the introduction of Superman. Some people praise him for his heroism, a la the looming statue in Metropolis’ ground zero. The government believes his power should be put into check, which leads to the establishment of a committee and an interesting montage of news clips Clark watches one evening. Batman wants to get rid of Superman all together. And others, specifically one Lex Luthor (Jesse Eisenberg), have different plans in mind. Though each of these plot lines are intriguing, they are each full plots in and of themselves, and exploring them fully would mean making each one into a full feature length film. However, Snyder chose to try and capture each – and more – of these storylines in a single two and a half hour block, thus resulting in a messy plot lacking significant turning points and a central protagonist. Unfortunately, the editing does little to streamline the plot either. Often, we jump, without clear direction, from Batman to Clark Kent, to Lex Luthor, then maybe to Diana Prince/Wonder Woman (Gal Gadot) or Lois Lane (Amy Adams), and over to Superman, and back again to Bruce Wayne. It leaves viewers confused and always feeling one step behind. It isn’t until the last 45-ish minutes of the film that we are given a motive, direction and climax. Despite the lack of central plot, the film is remedied by the stunning cinematography and spectacular special effects. Take the opening scene, for example. Snyder captured chilling beauty in the death of Martha and John Wayne. The camera captures extraordinary details not seen before, such as a close up of the gun pointed at the Waynes as it fires, or the cascading pearls falling from Martha’s broken necklace after she has been shot. The incredible visual features of the film only continue. Superman is just as awe-inspiring and believable as he was in “Man of Steel;” one can feel his power as he takes off in flight, breaking the sound barrier, or as he lands forcefully, ready to fight. But perhaps some of the most incredible visual effects come from the battle sequences in the latter half of the film. Those, I will not spoil because one, they are meant to be seen and not described, and two, I’m not sure if I can find adequate words to describe the incredible visual magic captured on the silver screen. Overall, though, did it disappoint? Yes. Is it an awful film? No. There are elements to “Batman V Superman: Dawn of Justice” that make it a film worth spending the money to see, if only to watch an incredible visual film. Fans were still delighted with the Easter eggs pointing to the Justice League film and a potential villain for the heroes to face. Plus, even though it was the first time Batman and Superman faced each other, this was the first time Wonder Woman has ever made an appearance on the big screen. And leave an impression she did. In the end, “Batman V Superman: Dawn of Justice” is just that: the dawn of something greater. Fans can look forward to “Suicide Squad” in August, as well as a Wonder Woman film and the ultimate Justice League picture. Sure, there was a lot that could have been better about this one, but DC is only getting their feet wet, and fans can be sure that after this film, executives are figuring out what it’s going to take to do these heroes justice.